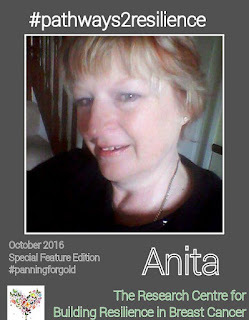 Anita is a dedicated ambassador of our Centre. The insight she brings to our private group fills every one of our members with hope and serenity. With her knowledge of mindfulness meditation and counselling her comments and guidance on our pathway to resilience is much needed. She is interactive and brings much valuable advice in our everyday posts as well as our Sunday discussions. We love Anita and so do all of our private group members! I had breast cancer and I'm making room for the activities I like doing. I love being an ambassador for the Centre for Building Psychological Resilience in Breast Cancer. I stumbled across the private group after spotting a post seeking research participants, and I'm proud to have been part of its growth. I can speak my truth there and know I'll be acknowledged. I am also delighted to support others by commenting and sharing thoughts and ideas. Around two and a half years ago I left my stressful corporate job with a view to completing a hypnotherapy and counselling course leading to a new career. I spent the summer having long lunches with friends. I took on some challenging voluntary work in a hospice in the spiritual care team, and everything was going swimmingly. Then following a routine mammogram came my breast cancer diagnosis, stopping me in my tracks and forcing me to spend a long winter travelling between my sofa and the hospital. My second year cancerversary looms. These days I'm seeking a quieter life: long lazy days filled with dog walks, yoga, reading, baking, writing, making cards - lots of solitary pursuits that feed my soul. I've joined a choir, which makes my heart sing. I volunteer at a community cafe, supporting young people with disabilities and learning difficulties. I'm still studying, which gives me the goals and projects I thrive on. Oh yes, and I am still a lady who lunches frequently. My wonderful partner Geoff, who has been my solid rock for nearly 30 years, works so hard to support me. I have a small pension from my old job, and if we can manage on what we have I'm not going to go back to work. My two amazing boys are out there in the world making their own way. It's my time now, and my goal is simply to live my life my way.